Self-Fusing Silicone Pipe Repair Tape. 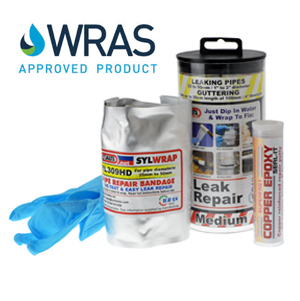 Sylmasta Wrap & Seal will stop leaks even when pressure cannot be turned off. Simply wrap the tape tightly around the pipe, using the centre line as a guide, until the leaks stops. The pipe repair tape will bond to itself to form a solid rubber band which maintains pressure over the leak. Finish by applying SylWrap over the Wrap & Seal to protect it and make a permanent repair.